March | 2012 | Wait... What? 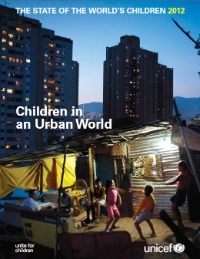 How can ICTs improve the lives of children and youth living in cities? At the global level, a very small percentage of development funding goes to urban spaces, yet hard-hitting issues impact many of the urban poor: lack of tenure, lack of legality of land, informal settlements, lack of birth registration and civil registration in general, waste disposal, clean water, politicizing of local authorities and more. Can new technologies be a solution for some of these issues? Tuesday’s Technology Salon NYC offered a space to discuss some of the key challenges and good practice related to working with children, youth, and urban communities and explored the potential role of ICTs in addressing issues related to urban poverty. According to UNICEF, who co-organized and hosted the Salon at their offices, half of the world’s people – including over one billion children – live in cities and towns. By 2030, it is projected that the majority of the world’s children will grow up in urban areas, yet infrastructure and services are not keeping pace with this urban population growth. (See UNICEF’s 2012 State of the World’s Children or Plan’s 2010 Because I am a Girl Report: Digital and Urban Frontiers). Sheridan Bartlett, a researcher affiliated with the Children’s Environments Research Group at CUNY and the International Institute for Environment and Development in London, co-editor of the journal Environment and Urbanization, supporter of Slum Dwellers International, and researcher on the link between violence and living conditions as they affect young children. Doris shared IBM’s experiences with technology education programs with children and youth in New York City, including the highly successful P-TECH program which prepares youth for jobs that require 21st century skills. Some of the key aims in the PTECH program are making technology accessible, engaging, relevant to children and youth, and connecting what kids are learning to the real world. Through the program, IBM and partners hope to turn out skilled employees who are on entry-level career tracks. They look at what jobs are hiring with AAS degrees, what skills are attached and how to map those skills back into curriculum. Helping children and youth acquire collaboration, communication, and problem solving skills is key to the approach, as are broad partnerships with various stakeholders including government, private sector, communities and youth themselves. The program has been lauded by President Obama and is in the process of being replicated in Chicago. Ron highlighted that working on urban poverty is not new. His involvement began in 1963 when John F. Kennedy was elected and there was a thrust to address urban poverty. Many, including Ron, began to think about their role in abolishing (not just alleviating or reducing) poverty. ‘We thought as architects, as planners about how we could address the issues of urban poverty.’ Broader urban poverty initiatives grew from work done forming the first youth in action community based organizations (CBOs) in Bedford Sty, Harlem and the Lower East Side. Originally these programs were empowerment programs, not service delivery programs; however because they confronted power, they faced many challenges and eventually morphed into service delivery programs. Since then, this youth in action community based model has served other community based initiatives all over the world. Ron emphasized the importance of differentiating among the roles of CBOs, technical assistance providers, and intermediaries and the need to learn to better to support CBOs who are on the ground rather than supplanting their roles with NGOs and other intermediaries. Sherry picked up where Ron left off, noting that she’d collaborated with a network of federations of the urban poor in 33 countries, looking at ways they’ve used technologies and how technology presents new challenges for communities. A large percentage of the urban poor live illegally in non-formal settlements where they can’t vote and don’t have legal representation, she said. They want partnership with the local government and to make themselves visible. The first thing they do is to count themselves, document the land they live on, map every lane and garbage dump, every school (if schools exist), their incomes, livelihoods, and expenditures. This body of information can help them engage with local authorities. It’s an organizing tool that gives them a collective identity that can lead to a collective voice. This process seems to be a natural fit for technology, in that it can allow for management and storing of information, she said. However, technology use can be incredibly complicated. Traditionally the process has been managed manually. The information comes in on paper, it is fed immediately back to community members, contested and corrected right there. The process is very participatory and very accurate, and includes everybody. Things that have been mapped or measured are validated. Boundaries are argued and joint agreement about the community reality and the priorities is reached right there. Sherry noted that when technology is used to do this, participation becomes more restricted to a smaller, more technically savvy group rather than the entire community. It takes longer to get the information back to the community. Many urban poor are technology literate, but there are complexities. Sometimes youth want to go with technology and older leaders are more comfortable with the more manual, inclusive processes. The complexity of urban environments was addressed by all three discussants. According to Sherry, many people still hold a development image of the ‘perfect village,’ contained, people sitting around a tree. But urban communities are very complex: Who owns what? There are landlords. Who represents whom? How do you create the space and the links with local authorities? Ron agreed, saying that cities and settlements tend to be far more pluralistic. Understanding the nature and differences among them, how to weave together and work together is critical. Doris noted that one organization cannot work on this alone, but that multiple partners need to be involved. It’s important to work directly with community based organizations rather than surrogates (in the form of external NGOs). It’s critical to work on building the capacity of people and organizations on the ground, recognizing them as the core actors. The process by which people engage is just as important as the end product. If new technologies are involved, participation needs special attention to ensure no one is being marginalized and the data is interpreted by local people, and they play a role in gathering it and learning, sharing and discussing during the process. Digital data collection and fly-over mapping should not replace participatory processes of data collection and local interpretation. Bringing in more efficient processes via new technologies is possible, but it often means losing some of the richness and interpretation of the data. If you’re not including everyone in this process, you risk marginalizing people from the process. Every community, village or barrio has a different personality. No one size approach or model or technology fits all. 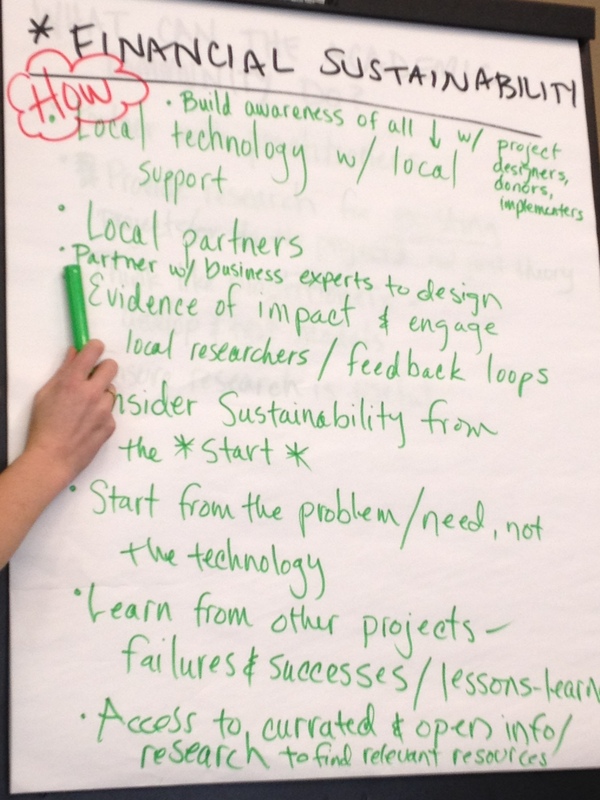 It’s important to let people create solutions to their own challenges; set the right policies so that what is produced can be scaled (open/open source); and make sure things are hyper-local – yet help move the ideas and build networks of south-south collaboration so that people can connect. The technologies only make sense when they are done within a participatory framework or context. People get excited about technology and the idea of really iterating and trying things out very quickly. But this only makes sense if you have a bigger plan. If you go in and start playing around, without context and a long-term plan, you lose the community’s trust. You can’t drop in tech without context, but you also can’t come and create such a huge infrastructure that it’s impossible to implement. You need balance. We shouldn’t forget protection and privacy issues, especially with children and with mapping. These need to be carefully built in and we need to be sure that information and maps are not misused by authorities. We can’t forget the young people and adolescents that we are working with – what do we want them to gain out of this? Critical thinking, problem solving skills? This is what will serve them. Educational systems need to address the pedagogy – if children are even in schools – where do you get that critical thinking? How do you create space for innovation? What is the role of tech in helping support this innovation? What is the role of mapping? Just accounting? Just quantifying? Or are you helping youth know their communities better? Helping them understand safety? What are we mapping for? 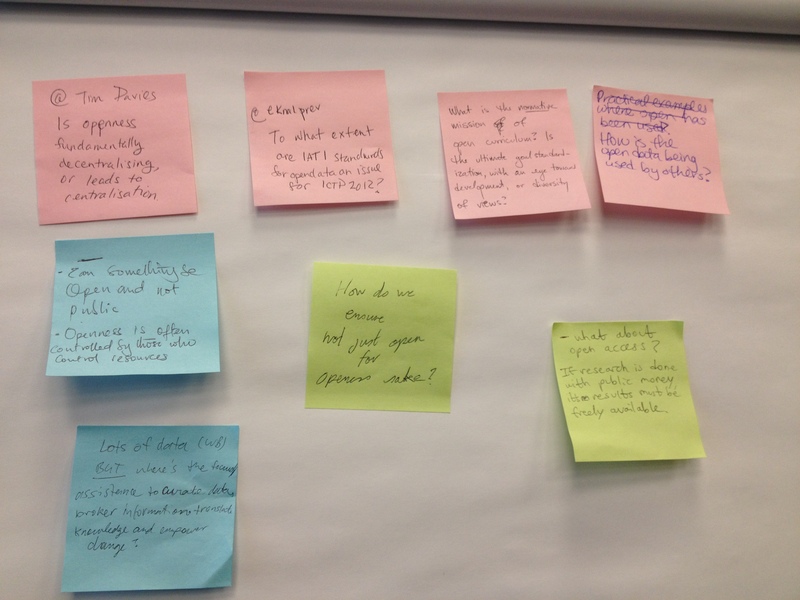 Community self-knowledge or outside advocacy? We need to always ask: Who owns and manages technology? Technology is never neutral. It can both empower and disempower people and communities, and certain groups of people within communities. The technology is a tool. It’s not the technology that teaches, for example, it is teachers who teach. They use the tech to supplement what’s going on in the classroom. Rather than bring in ‘really cool’ things from the outside, we should know what tech already exists, what children, youth and communities are already using and build on that. The challenge always comes down to the cost. Even if an idea works in the US, will it work in other places? Can other places afford the technology that we are talking about? There are some very good projects, but they are impossible to replicate. We need to find feasible and sustainable ways that technology can help reduce costs while it improves the situation for the urban poor. Bottom up is important, but it is not enough. The role of local authorities is critical in these processes but national authorities tend to cut local budgets meaning local authorities cannot respond to local needs. It’s important to work at every level – national policies should enable local authorities and mandate local authorities to work with local communities. Local authorities often need to be pushed to accept some of these new ideas and pulled forward. Often communities can be more technologically savvy than local authorities, which can turn the power dynamic upside down and be seen as threatening, or in some cases as an opportunity for engagement. Communities may need to learn to engage with local governments. Adversarial or advocacy techniques may be useful sometimes but they are not always the right way to go about engaging with the authorities. It’s useful for CBOs to work with both horizontal and vertical networks, and NGOs can play a role in helping this to happen, as long as the NGOs are not replacing or supplanting the CBOs. There needs to be support from the local city government, and an interest, a need, an expressed dedication to wanting to be involved or these kinds of initiatives will fail or fizzle out. There is a tendency to seek quick solutions, quick fixes, when we all know that creating change takes a long time and requires a long-term perspective and investment. The city of Medellin for example has done a good job of investing in connecting settlements to the city through infrastructure and access to technology. Long-term vision with participation from private, public and community engagement is critical. The quality of investment in poor areas needs to be as high as that in wealthier areas. Many interventions are low quality or limited when they are done in poor areas. Multiple partners and collaboration among them is necessary for these initiatives to move forward and to be successful. You need to bring everyone to the table and to have an existing funding structure and commitment from local and national governments and ministries, as well as local communities and CBOs, NGOs and the private sector. A role for the UN and INGOs can be to help ensure that the right channels are being opened for these projects, that the right partnerships are established, that systems and technologies are kept open and not locked into particular proprietary solutions. There is much to learn from how marginalized youth in communities have been engaged without technologies. Once they have the information, no matter how it was gathered — in the sand, by SMS, on the wall — then how can marginalized young people access and address local authorities with it? How can we help enable them to feel more empowered? What can we learn from past efforts that we can apply? There is a lack of exposure of those working in ICT to the urban space and vice versa. This reflects a need to break down the issues and opportunities and to think more deeply about the potential of technology as a part of the solution to urban poverty issues. We need to make a distinction between wonderful projects that some are doing, but that are very costly and have a high cost per participant; and programs that can be done in developing countries. Consider that 75 million youth are now unemployed. The more we learn about what others are doing, the more information we have on how to do it, the better. ICTs are a relatively new element in the urban space. It would be helpful to have a a follow-up report that focuses on how ICTs have been used to address specific issues with children, youth and communities in urban spaces and what specific challenges are posed when using ICTs in this space. What projects have been done or could be done? What are the challenges in implementing projects with refugee populations, undocumented populations, migrants, and other groups? We need to understand this better. We need a document or guide that explores these issues and suggests practical ways to move forward. Social media and new technologies can be used to spread information on successful case studies, to share our learning and challenges and good practice so that we can apply the best approaches. A huge thanks to ICT Works, UNICEF, our discussants and participants for making this 2nd Technology Salon NYC a success! 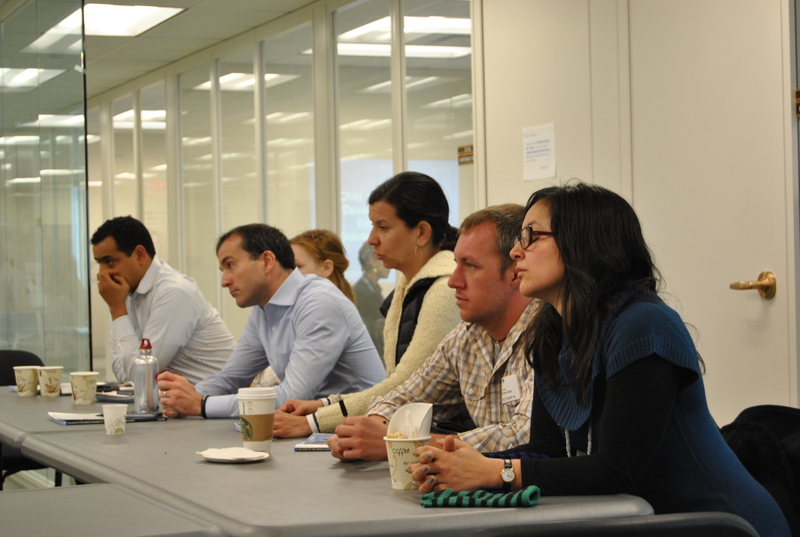 Save the date for our 3rd TSNYC, on April 13, 2-4pm at New York Law School. The topic will be the International Aid Transparency Initiative (IATI); how it can contribute to better aid coordination and effectiveness; challenges and opportunities for CSOs in signing onto IATI; and ways that technology and open data are supporting the process. Ann Blackman’s Off to Save the World is a chronicle of the life of Julia Taft. The book showcases how rare it was for women to be involved in high level politics in the 70s and 80s, and how Taft skillfully maneuvered herself in circles that were not open to many women in US Government or international affairs at the time. Taft was clearly a charming, witty, strong and determined woman who endeared herself to most everyone she met. I was struck while reading, however, that most of the relief efforts that Taft was involved in sounded an awful lot like operational failures, though they were hailed as diplomacy successes. This gave me much to consider both in terms of political motivations for relief and development efforts, and for observing how far relief work has come since then in terms of understanding the need to be prepared, to take direction from local governments and local populations, to set up proper logistical arrangements, and to maintain neutrality during humanitarian crises. Today, guidelines like the Sphere Handbook and the Red Cross Red Crescent Code of Conduct help orient aid workers and give them support and guidance during humanitarian relief operations. The book reads a bit like a history text book, which was its downfall for me. I would have much preferred a more personal style that engaged me more emotionally. In any case, it is great to see a strong female character like Taft highlighted, and she was clearly much loved by her colleagues, peers and family. Ann Blackman is the author of many biographies including Seasons of Her Life, Wild Rose, and co-author of The Spy Next Door: The Extraordinary Secret Life of Robert Philip Hanssen. She previously worked at TIME magazine and The Associated Press, and has appeared on various national TV and radio shows such as A&E Biography, The Diane Rehm Show, Hardball with Chris Matthews, CNN, Fox Morning News, CSPAN, to name a few. She currently lives in Washington, DC, and on the coast of Maine. I went to a great meeting hosted by NetHope and Plan International in Cairo, Egypt during the last week of February. The idea was to get several of the NetHope partners together — both IT companies and INGOs — to discuss ways of working together in the area of ICTs and Education. I took advantage of the meeting to make some more “Reality Videos”, similar to the mHealth Reality Videos that James Bon Tempo and I did during the mHealth Summit. 2) Nzila shares what was learned at the workshop and focuses on Grapho Game, a tool to improve literacy in local language. 3) Marcha Neeling says throwing devices at people will not solve any development issues. 4) Mohamed Hussein talks about how ICT4D needs to be led by programs and supported by ICT staff, not the other way around. 5) Maria Berenguer notes that teachers need computer training first if they are to use computers with their students. 6) Chris Bane reminds us that we don’t always need super sophisticated tools. Sometimes very simple ICTs can make all the difference. 7) Edison Nsubega explains that it’s important to base your selection of ICT tools and platforms on the local context and situation that you are trying to resolve. This was the question explored in a packed Room 3 (and via livestream and Twitter) on the last day of the ICTD2012 Conference in Atlanta, GA.
Panelists included Matthew Smith from the International Development Research Center (IDRC), Soren Gigler from the World Bank, Varun Arora from the Open Curriculum Project and Ineke Buskens from Gender Research in Africa into ICTs for Empowerment (GRACE). The panel was organized by Tony Roberts and Caitlin Bentley, both pursuing PhD’s at ICT4D at Royal Holloway, University of London. I was involved as moderator. As background for the session, Caitlin set up a wiki where we all contributed thoughts and ideas on the general topic. Tony started off the session explaining that we’d come together as people interested in exploring the theoretical concepts and the realities of open development and probing some of the tensions therein. The wiki does a good job of outlining the different areas and tension points, and giving some background, additional links and resources. Matthew opened the panel giving an overview of ‘open development,’ including 3 key areas: open government, open access and open means of production. He noted that ICTs can be enablers of these and that within the concept of ‘openness’ we also can find a tendency towards sharing and collaborating. Matthew’s aspiration for open development is to see more experimentation and institutional incentives towards openness. Openness is not an end unto itself, but an element leading to better development outcomes. Soren spoke second, noting that development is broken, there is a role for innovation in fixing it, and ‘open’ can contribute to that. Open is about people, not ICTs, he emphasized. It’s about inclusion, results and development outcomes. To help ensure that what is open is also inclusive, civil society can play an ‘infomediary‘ role between open data and citizens. Collaboration is important in open development, including co-creation and partnership with a variety of stakeholders. Soren gave examples of open development efforts including Open Aid Partnership; Open Data Initiative; and Kenya Open Government Portal. Varun followed, with a focus on open educational resources (OER), asking how ordinary people benefit from “open”. He noted that more OER does not necessarily lead to better educational outcomes. Open resources produced in, say, the US are not necessarily culturally appropriate for use in other places. Open does not mean unbiased. Open can also mean that locally produced educational resources do not flourish. Varun noted that creative commons licenses that restrict to “non-commercial” use can demotivate local entrepreneurship. He also commented that resources like those from Khan Academy assume that end users have a computer in their home and a broadband connection. Ineke spoke next, noting that ‘open’ doesn’t happen in a vacuum. Sometimes power relations become more apparent when things become open. She gave the example of a project that offered free computer use in a community, yet men dominated the computers, computers were available during hours when women could not take advantage of them, and women were physically pushed away from using the computers. ‘This only has to happen once or twice before all the women in the community get the message,’ she noted. The intent behind ‘open’ is important, and it’s difficult to equalize the playing field in one small area when working within a broader context that is not open and equalized. She spoke of openness as performance, and emphasized the importance of thinking through the questions: openness for whom? openness for what? Should any research done with public funds be publicly open and available? This was a fundamental values question for some. Can something be open and not public? Some said that no, if it’s open it needs to be public. Others countered that there is some information that should not be public because it can put people at risk or invade privacy. Others discussed that open goods are not necessarily public goods, rather they are “club” goods that are only open to certain members of society, in this case, those of a certain economic and education level. It was noted that public access does not equal universal availability, and we need to go beyond access in this discussion. Is openness fundamentally decentralizing or does it lead to centralization? Some commented that the World Bank, for example, by making itself “open” it can dominate the development debate and silence voices that are not within that domain. Others felt that power inequalities exist whether there is open data or not. Another point of view was that the use of a particular technique can change people without it being the express intent. For example, some academic journals may have been opening up their articles from the beginning. This is probably not because they want to be ‘nice’ but because they want to keep their powerful position, however the net effect can still be positive. How to ensure it’s not data for data’s sake? How do we broker it? How do we translate it into knowledge? How does it lead to change? ‘A farmer in Niger doesn’t care about the country’s GDP,’ commented one participant. It’s important to hold development principles true when looking at ‘openness’. Power relations, gender inequities, local ownership, all these aspects are still something to think about and look at in the context of ‘openness’. The general consensus was that it is important to fight the good fight, yes, but don’t lose sight of the ultimate goal. Open for whom? Open for what? As organizers of the session, we were all quite pleased at the turnout and the animated debate and high level of interest in the topic of ‘open development’. A huge thanks to the panelists and the participants. We are hoping to continue the discussions throughout the coming months and to secure a longer session (and a larger room) for the next ICTD conference! Note: New Tactics is discussing “Strengthening Citizen Participation in Local Governance” this week. There are some great resources there that could help to ground the discussion on ‘open development’. Visit the ‘does openness enhance development’ wiki for a ton of resources and background on ‘open development’! I’ve been thinking quite a bit about the sustainability of ICT4D initiatives over the past couple months in preparation for a panel I participated in yesterday at ICTD 2012 and due to a good discussion on the topic while at a workshop in Cairo hosted by NetHope and Plan International in late February. At the Cairo workshop a group of INGOs, ICT corporations and a representative from the Ministry of Education’s ICT section discussed replicability, scale and sustainability in ICT and Education programs at length. At yesterday’s panel, we tackled the more specific topic of financial sustainability with folks from NGOs, contractors, corporations, ICT associations and researchers. The themes and challenges that came up in both of these discussions were similar, whether looking at more ICT-driven projects (eg., providing computer equipment) or smaller social enterprises or very large government or aid-funded programs that seek to integrate ICTs into other areas like health, education, agriculture, or economic empowerment. Sustainability is a real challenge for all these kinds of programs. Individuals and organizations are trying to build in sustainability in various ways, from supplementing ICT platforms with advertising to charging end users small fees to seeking funds from corporations and institutional donors to conceiving of ICT initiatives as small enterprises. The need should be identified by the community. The initiative should be owned by the community and co-created with end users, not designed and parachuted in from the outside. When the benefits of a program (ICT related or not) are not tangible, it may be necessary to do some buy-in work and awareness raising with people to help make the benefits of an initiative more clear to the broader population. It’s important to do a baseline and some monitoring and evaluation to know whether or not the initiative is indeed having an impact. If you have to pay people to participate, you’ve got issues. The market by nature excludes large swaths of people. At the same time, giving away free stuff usually hurts development efforts because people often do not value that which is ‘free’. (On the other hand, if people are not willing to pay for something, some would say you haven’t identified a real need). Even ‘poor’ people do have some resources, so their contributions to this or that project need to be carefully analyzed and weighed as part of the process. There are differing opinions around the privatization of services like water, education and healthcare and whether people should be paying for these or whether they are rights that governments need to be held responsible for as duty bearers. Some kind of balance needs to be found here. managerial – have the right people managing a program, especially if it’s meant to grow and scale. ICT solutions that save people money and time can be sustainable from within. If the problem can be resolved in a cheaper, simpler way without them, then don’t suggest using ICTs. Start small with scale and sustainability in mind from the very start. For both financial and technological sustainability, it’s important that the technology tools and devices as well as the technical support is local. Local partners should be involved in implementation. Research on impact should also not be exclusively done by those from the outside, but rather should involve local researchers. Local feedback loops can assist with more real-time understanding of how the initiative is faring. Telecoms and IT companies are looking out for their bottom line. Development agencies and civil society organizations by nature are supposed to be looking out for the most marginalized and excluded. NGOs and civil society will likely resist privatization of areas like education and health. Governments will have their own agendas and self-interests. NGOs will have their own funding interests as well. There are vastly different approaches, paces, deliverables, timelines and methodologies among these three types of institutions who are all involved in the ICT4D space. Trying to harmonize these interests alongside what communities want can be a huge management challenge and can have a strong impact on sustainability concepts and approaches. Often the sustainability plan for projects by INGOs or local NGOs is “the government will assume responsibility” or “the community will assume the costs and management.” This can be a big issue if not properly planned from the start. If every development program plans for the government to take on the costs for the program, but this has not been discussed fully, agreed on or budgeted by the government, there will be real issues with sustainability as there won’t be enough budget to cover the continuation of all these projects and programs. There is a role for greater aid coordination here, for example via the International Aid Transparency Initiative (IATI) and for open publication of government budgets and spending plans. Localization of costs is important. If an INGO is paying high salaries during the initial funding stage and then wishes the government to take on the program costs, the project may collapse. Also check out last November’s huge debate on ICT4D vs ICT4$. It’s worth reading as it highlights elements of the sustainability discussion from a broader perspective and pulls in opinions from several well-known authorities on the topic. This is a guest post by Anna Shaw, one of my newest colleagues. Anna talks about how to be skeptical about Invisible Children’s Kony 2012 campaign yet still get involved in the issues in a thoughtful way. I woke up yesterday, picked up my iPhone and almost immediately clicked on a link to Invisible Children’s Kony 2012 video. Even before I ate my breakfast, Jason Russell was showing me how I could help stop the terror of the Lord’s Resistance Army. My first reaction was “This is awesome!” The conflict in Northern Uganda has interested me since I first learned about it in high school, and helped spark my deep-seated interest in peace and justice in Africa. I was really happy that someone was trying to connect young people just like me to something that really matters. But almost immediately, Twitter filled up with people questioning what Kony 2012 and Invisible Children were doing. The rest of my day was filled with blog post after blog post of comments on the campaign, and just as quickly as I hopped on the bandwagon, I was jumping off. But why? The problem really has to do with the story Jason Russell is telling. He’s made a twenty year conflict into a Disney Film, where the US can swoop in and save the day. But there is a lot more going on than that. No one is denying that Joseph Kony is the bad guy, or that the LRA has wreaked havoc all around the region. But there are some questions we should be asking before we launch into this wholeheartedly. I don’t want anyone to think there is a ‘nice’ side to Joseph Kony. There isn’t. But there are other pieces to the puzzle which Invisible Children seem to have forgotten to mention. Conflicts and wars are never as simple as good vs. bad, and arresting Kony is not going to solve the problems for people in Uganda or the nearby countries that the LRA is affecting. There are a number of other groups, rebels and armies, that have nothing to do with Kony who continue to terrorize this region. On top of that, conflict has destroyed jobs, roads, schools, hospitals, and many other essential things in these areas. We need to look at how people can rebuild their lives and deal with problems that helped start the conflict to begin with. Before talking about ending the LRA’s rampage, we should understand more about the where and why of the conflict and how it’s really affecting people in the region. We should also think about what the goal really is: finding justice for people in Uganda and elsewhere is much larger than putting Kony behind bars. Who is this really about? It’s easy to forget while watching this video that Ugandans aren’t sitting around waiting for us to help them. They have managed to deal with the LRA for more than twenty years, so by intervening, the US would definitely not be saving the day for most Ugandans. We need to get out of the mindset that the US has all the answers, and instead listen to what Ugandans actually need from us. That’s what this should really be about, sharing the stories of Ugandans and the people from the many other countries affected by the LRA. Their voices are almost unheard in the video, giving them no room to express themselves or provide us a true understanding of their situation. In the end, they are going to be saving themselves and resolving their own problems, and we can only help them do that. Another point many people have brought up about this campaign is whether or not Invisible Children will use your money well. Several people have questioned the way Invisible Children spends money, and how much they are actually changing the lives of people in Uganda. I believe this is something you should decide for yourself. Before you decide whether to donate money or buy a t-shirt, ask questions. There are many great organizations working in Uganda, all of which could benefit from your donations, so make sure you are happy with the one you choose. When choosing, think about the impact the organization is having on the lives of Ugandans and try not to get distracted by how cool its videos and swag are. The Kony 2012 Campaign does a few things exceptionally well. It tells a simple, moving story that captures our hearts and makes us feel powerful – like we can actually do something to help. And we can! In fact, there are a lot of things we can do beyond liking something on Facebook or re-Tweeting a tweet. Educate ourselves. If you don’t get anything else from this whole blog, take this away: learn about these issues. Read books. Google stuff. Look it up on Wikipedia. Understand what is going on and pass on that knowledge to your friends, family, everyone. Find people who know the situation in-depth, contact them and ask them for their take on the issues. Don’t let one campaign be the only source of information you get. Be curious and ask questions. Look at a variety of sources, and see if you can find a variety of respected voices and independent commentary by people from the country you want to help too. Focus on Positive Change. When it boils down to it, Kony 2012 focuses on stopping the bad guy. But what can we do to help the good guy. Or even just help the regular guy or gal. And their kids. And their kids’ kids. Think about what will be most effective in the long-term to reduce instability and support people’s well-being. Talk to our representatives in Congress. One thing Kony 2012 did right was making it easy to contact Congress and encourage young people everywhere to engage in public policy. But, instead of asking for military intervention in Africa, why not talk to Congress about addressing the needs of people on the ground? Talk to Congress about doing something positive: supporting schools, hospitals, agriculture, drinking water – and the many other things that can impact the lives of people in this area. Get Involved. Like I said earlier, there are a lot of incredible groups working to help those hurt by the LRA, and they can all benefit from your greater involvement. Changing the world takes more than hitting the “Like” button, and unless people like you are willing to step up and take action, not much is really going to change. Do some research and find out who is doing good programs on the ground and how you can support by donating. I am not here to tell you not to support Kony 2012. In fact, I plan on supporting it in my own way. I think its important that Americans are more aware of the world we live in, and this is a powerful way to do that. But I want to make sure the world changes for the better in the long run, not just the next nine months before 2013 rolls around. If you want to jump on a bandwagon like I was about to, it’s really important to understand what you are supporting first. And certainly don’t take my word for it. Here is a list of the commentary on Kony 2012 if you want to read more. Here is Invisible Children’s response to the criticism against them. Afripop has pulled together some African reactions to the Kony 2012 campaign. If you happen to be in New York City and have a couple of hours to spare, come on by to this panel today from 12-2 at UNICEF’s Danny Kaye Center. I’ll be doing an overview of some research that Keshet Bachan and I worked on late last year for UNICEF. There will be some fantastic examples from Tostan, Equal Access, New School and UNICEF on creative ways that new technologies can be used when working directly with marginalized adolescent girls. We’ll also discuss how ICTs and communication for development (C4D) can be used in broader outreach aimed at changing mindsets and behaviors to look more favorably on girls and their capacities and improve their access to new technologies. Update: Here’s an article and short video about the panel.